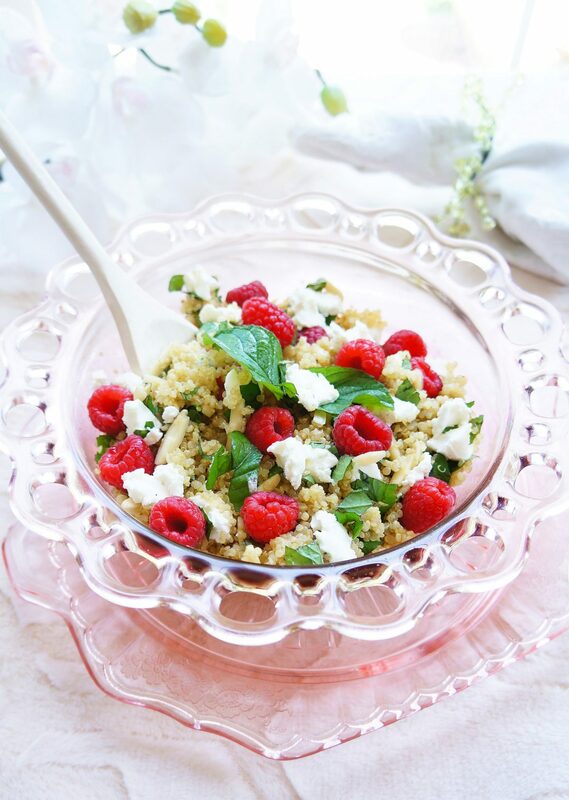 A healthy and light quinoa salad loaded with raspberries, basil, goat cheese and a light balsamic dressing. 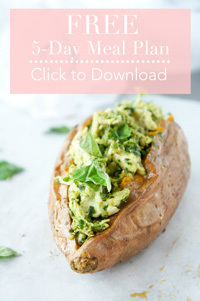 A perfect summer salad that’s gluten-free and vegetarian! So just in case you haven’t clued in yet (or maybe you’re not even Canadian and don’t even care), Canada day is at a really awkward time this year. Doesn’t Canada Day or more importantly, my day off, usually fall sometime around the weekend? This year it falls right smack in the middle of the week. Now I love having a long weekend and everything, but I definitely can’t complain about getting a day off on a Wednesday. We are having our traditional Canada day backyard potluck this week. Socializing, sunshine (hopefully), and lots of good food. I thought a nice refreshing quinoa salad would be the perfect dish to prepare. I’ve always enjoyed planning a menu according to a specific theme. So for Canada day this year, I decided to go with the red and white theme. What I love about quinoa is that it’s SO versatile. You can throw anything in there from cheese and nuts, to chocolate and dried fruit to put a totally different spin on it. This time around, I decided to do a sweet and savoury quinoa salad. It’s right around that time of year where raspberries are in season, so what better way to incorporate a dose of flavour and antioxidants than by using some fresh and juicy raspberries?! Add in some crumbled goat cheese and you’ve got a very patriotic quinoa salad. Look at that red and whiteness. The green basil could technically make it Italian, but we’ll just ignore the colour of the basil for this week. Deal? And if you happen to be American, just throw in some blueberries for a patriotic spin! And I’m telling ya, this flavour combo tastes great with anything from chicken to beef, or any other tasty foods that will be sizzling up on the grill. It’s not only refreshing, but also packed full of fibre, protein and healthy fats, so you really can’t go wrong with this salad. Can’t wait to see some of the other patriotic dishes at the BBQ! In a large bowl, toss together quinoa, almonds, and basil until evenly distributed. Pour the dressing into the bowl and mix until well combined. Add in goat cheese and raspberries. Gently fold to distribute throughout salad. Eat immediately, or chill for later. If you're going to chill it, leave out the raspberries and goat cheese and throw them in just before eating. What a perfect combination of flavors. Love the colors and how healthy this is. Thank you Ali! It’s a really simple, yet refreshing combo and those raspberries add a nice burst of flavour! 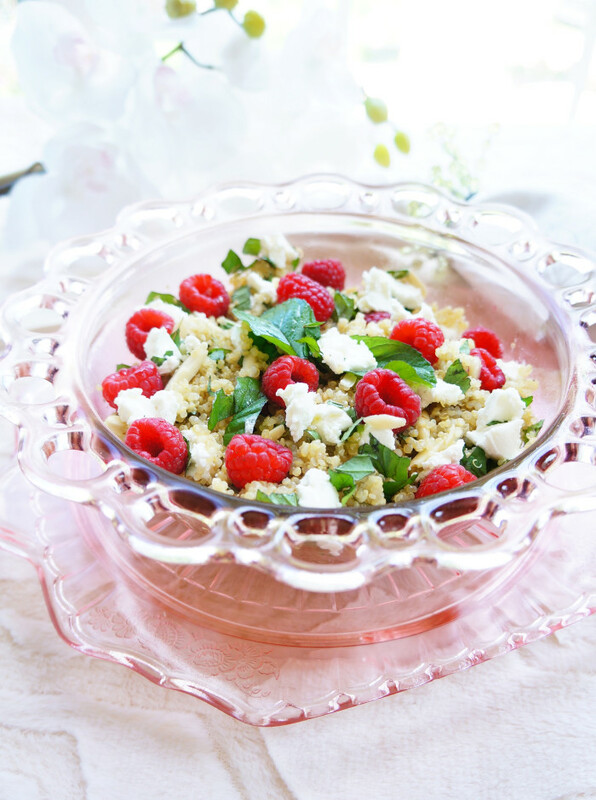 I love how you added raspberries to this dish–so a fun burst of flavor! I am loving quinoa! It’s so versatile. 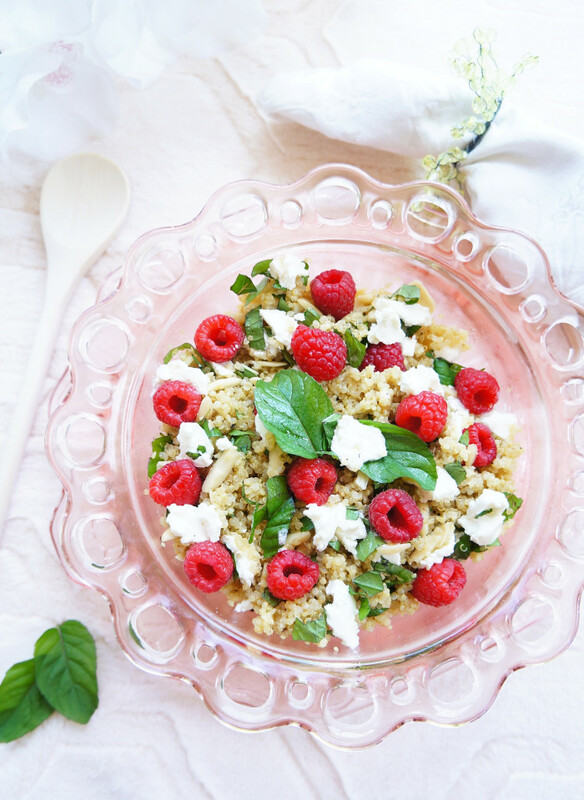 Raspberries and goat cheese sound AMAZING! Isn’t quinoa awesome Amy??!! You can do so much with it and it goes well with so many different flavours! 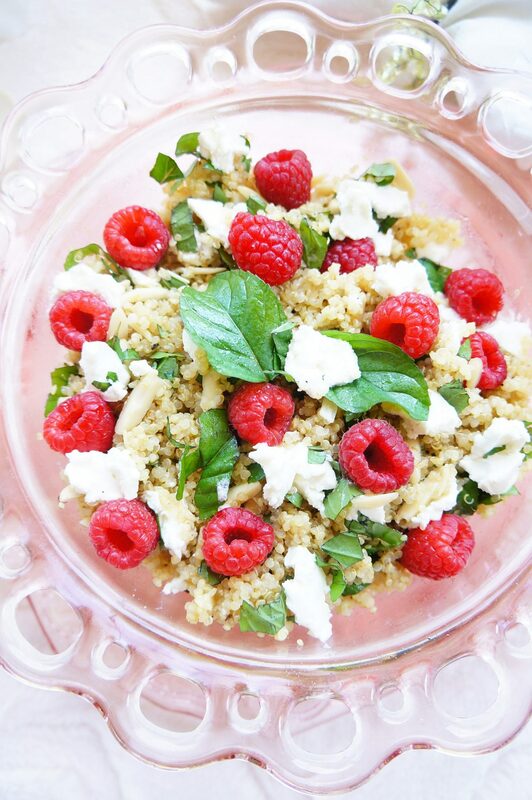 The raspberries and goat cheese definitely make a nice combo! Fresh raspberries, creamy goat cheese, and basil- such a wonderful flavor combination! Thanks Kelley! Love using all those fresh, simple and healthy ingredients! What a pretty summer salad! I love the sweet, nutty, and cheesy combination of flavors!